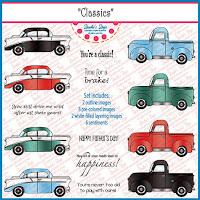 Today I have a masculine card with some classic cars. I used a digital pre-colored image from Deedee's digis called "Classics." I printed one larger image, and then created a border of the other pre-colored images in a smaller size. I added some dsp that has a road map along with a punched border done with an EK bricked punch. After adding some assorted colored and silver brads and green cardstock mats, I called this one done. Thanks for stopping by and make it a great day whatever you're doing. Such a fun masculine card!!! This road map background is just perfect for these cars!! And love the bricked punched banner!! Very creative work! Well done, my friend! Love the way you added the border at the bottom with all the cars on it Carol! 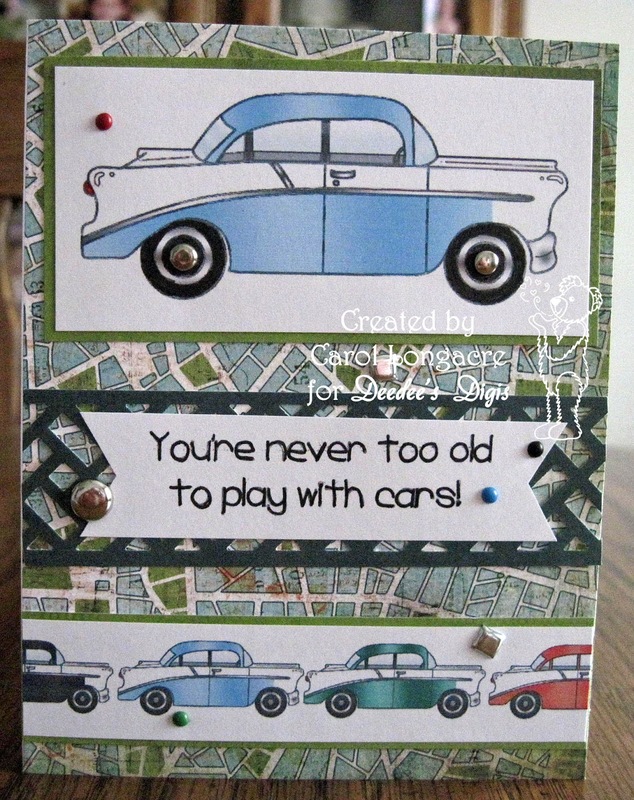 Wonderful card AND car too! A fabulous card Carol - a brilliant masculine design. Fantastic guy card. The brick punch looks like a road and I love the little gems you added. A super design for a man. I love the classic car, and the map paper is the perfect background. Well now I know those digis were right up your ally! Nice job with this one, Carol! Great card! It's cool that you made a car border. Thanks for joining us at Little Red Wagon. I know a lot of guys who would agree with this sentiment. This is a fun card!